Healthy smoothies are more popular then ever, and for good reason. When life gets busy, it can be a challenge to eat healthy. And reaching for a ready-made blend of the good stuff when you’re pressed for time can be a true godsend! But, with an increasingly large range of options to choose from, how can you be sure you’re making the right choice? 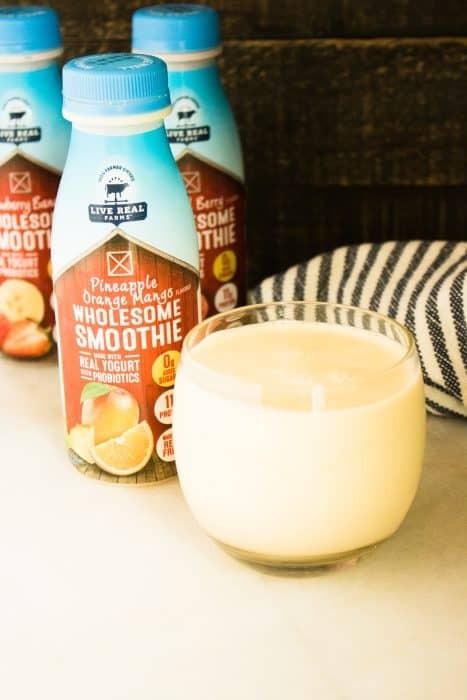 Luckily, Live Real Farms eliminates the guesswork by offering three different ready-made, healthy smoothies that not only taste delicious, but also contain only high-quality, all-natural ingredients. Smoothies are a great source of essential vitamins and nutrients. Since many people (especially kids) don’t eat the recommended daily servings of fruits and veggies, drinking healthy smoothies is a good solution. Smoothies — especially when made with yogurt — are also rich in protein, which helps keep your energy levels up on even the most hectic days. Some of the popular brands on the market appear to be healthy, but upon closer inspection, aren’t actually so great. Many are loaded with sugar — as much as 55 grams in a single serving! They can also contain additives such as preservatives and artificial coloring, making them not much better than a typical soda. 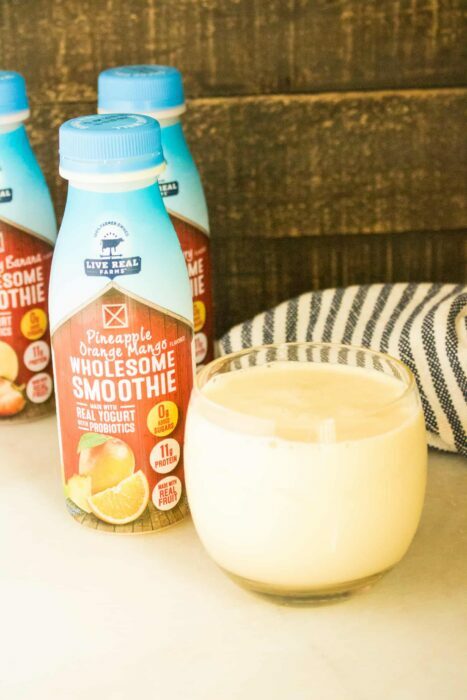 Thankfully, Live Real Farms Wholesome Smoothie products are made with nothing but all-natural, fresh ingredients. And, they contain zero added sugar. 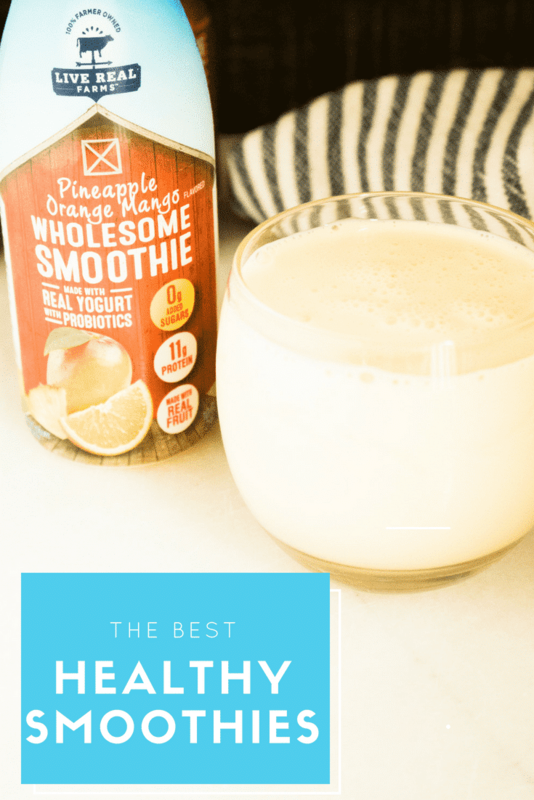 Their simple, yet high-quality ingredients provide all the nutritional benefits and great-tasting flavor you want, and none of the stuff you don’t! The terms “live and active cultures” refer to the living organisms Lactobacillus bulgaricus and Streptococcus thermophilus. They convert pasteurized milk to yogurt during the fermentation process. These strains of “good” bacteria, or probiotics, help to improve both digestion and immune function. Strawberry Banana, the classic smoothie pairing of juicy strawberries and sweet bananas, made even better with creamy, good-for-you, probiotic yogurt. Mixed Berry lets you enjoy the flavors of summer all year around. It’s a perfect blend of blueberry, blackberry, raspberry and strawberry that will make your taste buds happy. Pineapple Orange Mango is a refreshing taste of the tropics, combined with the added health benefits of live and active cultures. Ready to run out and pick up a bottle (or three)? Go to the Where To Buy section of the Live Real Farms website and type in your ZIP Code to find the location nearest you! Enjoying healthy smoothies have never been easier, whether you’re at home or on the go! As a 100% farmer-owned company, Live Real Farms is committed to producing healthy, high-quality food. They work to ensure the sustainability of their farmlands for future generations, and are as passionate about their food as they are about their community. Visit their website to learn more about their products, animals, and stewardship.